As 2012’s halfway point approaches, I’d like to share a simple, seven-step checklist to help you evaluate your 2012 content marketing success. Granted, many large firms, and those who serve them, already have content marketing monitoring and tracking systems in place. These, however, are often aimed at measuring response to specific articles, blog posts, and sign-up incentives. My goal, however, is to encourage a wider spectrum of businesses and self-employed professionals to take a fresh look at their content marketing from a broader, long-term perspective. As always, I’ve found the best way to approach any creative, analytical, or research task is to ask a series of questions, organized into key categories. The process will help you pinpoint the areas of your content strategy that are working well, and those that could use some fine-tuning. 1. Consistency: How consistent is your content marketing? Content marketing success requires consistency and predictability because it projects a professional image and builds comfort, familiarity, and trust. Rate how consistently you share content to attract new prospects and retain existing clients and customers. Consistency, of course, boils down to the existence of a detailed schedule, or editorial calendar, and your ability to keep it up to date. 2. Relevance: Does your content marketing deliver the right information? Rate your content’s ability to help your market solve its most important problems and achieve its most important goals. In order to answer this question, you may want to begin by reviewing your reader or website visitor personasand comparing them to benchmark metrics like comments, re-tweets, “likes,” referrals, landing page visits, and conversions. 3. Style: Does your content engage your market? Style is a measure of tone, or your ability to provide helpful, relevant information in an authoritative, yet conversational way. One of the best ways to engage your markets’ interest is to use stories the audience can relate to, which provides a context for the information you’re sharing. Style often emerges over time. Do you feel you are improving your ability to provide meaningful content shared in a conversational style? 4. Efficiency: Do you have an efficient process for selecting and producing topics for your content? Efficiency eliminates the needless frustration, stress, and burn-out caused by constantly struggling to meet deadlines. Efficiency measures your organization’s ability to choose topics, delegate responsibilities, produce, and edit/obtain approval for each topic on a timely basis? Signs of possible trouble include an undue emphasis on meeting deadlines, frequent last-minute meetings, multiple phases of rewriting, and ruffled feathers all around. The goal here is to create a content marketing process that resembles a well-oiled machine — one that works reliably and consistently, with few gaps or procedural breakdowns. Ideally, your efficiency will increase each month, as you continue to tweak your processes to make up for the shortfalls you find through this analysis process. 5. Influence: Does your market position or level of influence improve each month?Influence is a measure of the cumulative impact of your individual content marketing projects. 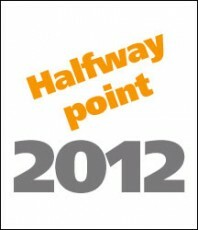 Although the metrics associated with individual projects (i.e., articles, blog posts, events, etc.) may change, influence refers to the “big picture” or long-range view of your firm relative to its competitors. As with efficiency, your firm’s influence should reflect continuing improvement each month. 6. Goals: Does your content support your firm’s long-term goals? Content marketing should support both short-term and long-term goals. An overemphasis on deadlines and specific projects can get in the way of completing major projects, such as premium books, major reports, research projects, or white papers. Ideally, individual content marketing projects should be viewed as building blocks that can be repackaged and used as elements in future major projects or new business initiatives. 7. Challenge: Does your staff find your content marketing to be adequately challenging? Avoid complacency. Content marketing should never become so routine that your staff members fail to challenge themselves by addressing new topics and ideas. Predictability can be deadening, and if your staff is bored because your content constantly readdresses the same topics, your audience is probably bored, too. Influence and thought leadership come from moving beyond the expected. The process of challenge and discovery — going “beyond the box” in your thinking — creates an electricity that can ignite your staff’s passion — and its ability to outperform its existing successes. In the process, challenges can energize your market, and set your firm apart from others in your field who are satisfied with maintaining the status quo. 1. 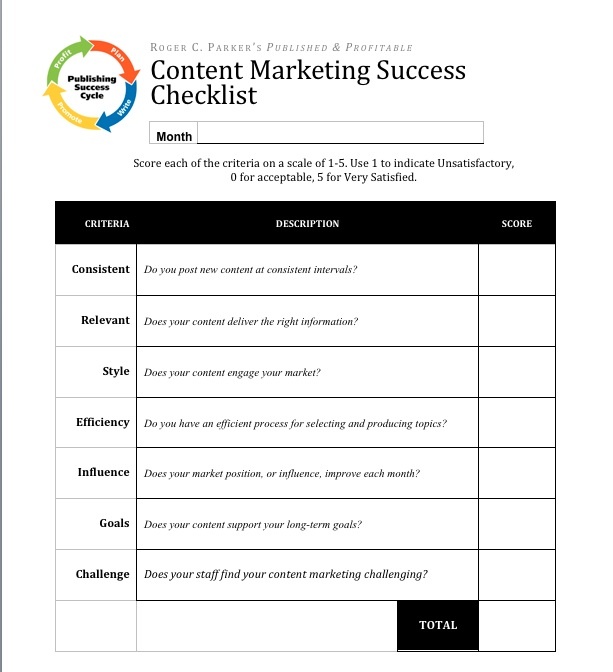 Share the Content Marketing Success worksheet (click for full-sized version) with your staff. Encourage them to download and print the worksheet, copy and paste it into a spreadsheet, or convert it to a survey form posted on your firm’s intranet. 2. Rate your content marketing on a scale of 1–5. Enter 1 to indicate “unsatisfactory,” 3 for “acceptable,” and 5 to indicate “very satisfactory” results. When you are finished, add the totals for all your responses (and the responses of your staff), and see where your content strengths and weaknesses lie. Over time, you may also be able to use your responses to identify certain trends in your content creation efforts, which you can then use to guide you toward the most essential changes you will want to make in your processes. Although the Worksheet it is intended for mid-year use, you may want to revisit it on a monthly basis. Encourage your staff to re-address the questions without referring to their previous responses. Ideally, your score will increase each month. No content marketing program is ever finished — there is always room for improvement. How does your firm measure the long-term success of your content marketing program? Are there any other questions, or topics, that should have been included? Share your suggestions as comments, below.